Sinaloensis is a nice short mat forming salvia from tropical Sinaloa, north western Mexico. 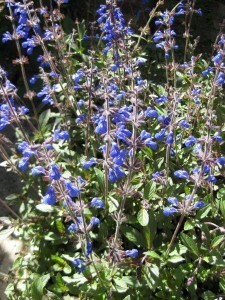 The foliage goes purple with a lot of sun, and may be semi dormant in a cold winter. It has bright blue flowers. One of its trade names in Australia is ‘Aztec blue’. It has been sold through nurseries quite a bit. For a few months it was sold as salvia viridis until the wholesale nursery got around to renaming it despite the mistake being pointed out a few times. Sinaloensis makes a good border plant if you don’t mind it to be fairly dormant in a cold winter. Bad drainage and serious cold could kill it in winter.